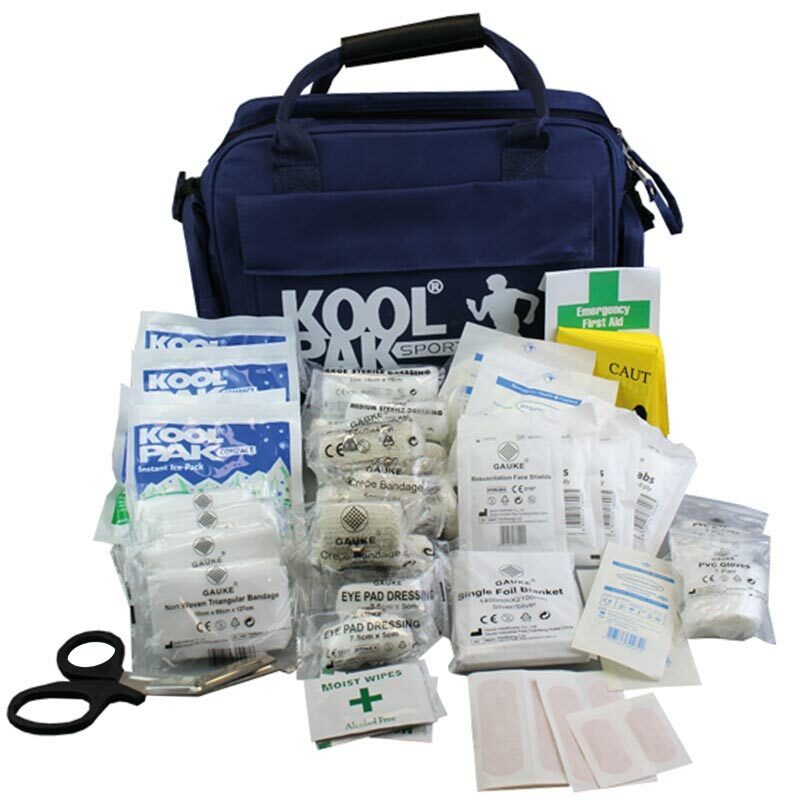 The Koolpak ® Sports First Aid Haversack is an excellent value first aid kit for teams when training, playing matches at home or away. With everything you may need to deal with minor injuries. Standard first aid kit in a sturdy water resistant haversack. Adjustable shoulder strap and carry handles. Internal compartments for keeping smaller items safe. Bag size - 46 x 25 x 12cm. 2 x Adhesive Dressing 6 x 7cm. 2 x Adhesive Dressing 8.6 x 6cm. 3 x Bio-Hazard Disposal Bags. 1 x Conforming bandage 12cm x 12cm. 1 x Conforming bandage 18cm x 18cm. 1 x Conforming bandage 28cm x 18cm. 2 x Crepe bandage 7.5cm x 4.5m. 6 x Instant Ice packs. 5 x Pairs of Latex gloves. 2 x Low Adherent dressing 5 x 5cm. 1 x Pack of plasters - assorted. 1 x Resuscitation Face shield. 2 x Sterile Eye pads. 1 x Tape - 1.3cm wide (Micropore). 2 x Wound Closure Strips 3 x 7.5mm.